Bejeweled. Rugged. Solar-powered, projection-enabled, holographic, pearl-enameled, multi-media equipped. To say we see a lot of mobile phone and tablet cases throughout the year is an understatement. However, one that stood out last year was the Vortex Bamboo Case from XA Wireless. 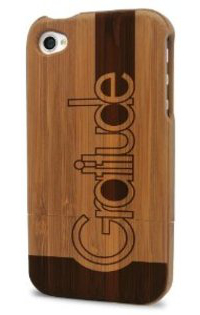 The natural bamboo wood combined with the positive messaging like Gratitude, Believe, and Imagination engraved into it made this a favorite of ours. This year, the company behind the simple and inspirational case is extending their line of products. In addition to the cases that fit the new iPhone 5 and iPad Mini, they will introduced leather cases for phones and tablets with their trademark messages embossed into them. XA Wireless is also rolling out a line of car chargers, home chargers, and headphones. These newer items have interchangeable plates so you can pick the inspirational message you want to experience each day. The iPhone cases retail for $40. No price yet on the newer items, but expect to see them later this year.